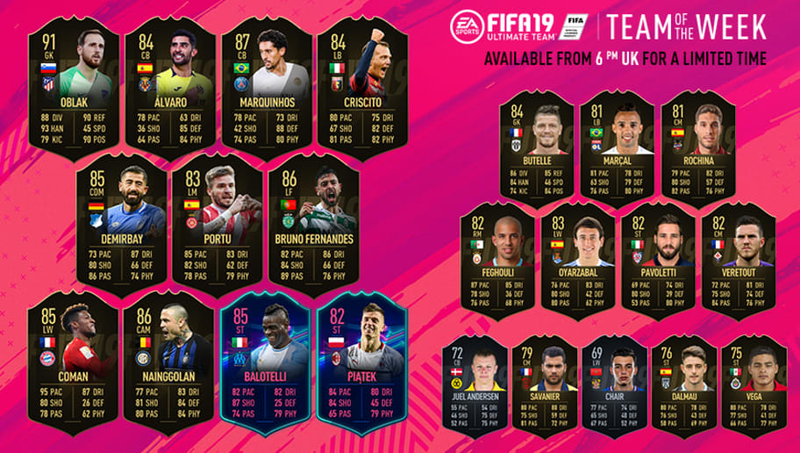 It's that time of the week again, with EA Sports' FIFA 19 releasing their brand new team of the week cards for Ultimate Team. For years now, gamers up and down the country eagerly anticipate the new release of cards rewarding some of the best individual performances from the previous week's games from around the world. The ​Atletico Madrid custodian has been imperious throughout this 2018/19 campaign, and this was confirmed once again with a clean sheet against Rayo Vallecano. This took his seasonal tally to a mighty 15 from 31 appearances, and his overall total to 108 in 193 Atletico outings. This TOTW 23 card hands Oblak a 91 rating, one up from his normal one, with 88 diving, 93 handling, 79 kicking, 90 reflexes, 45 speed and 90 positioning. Tasty stuff. The conquerer of Manchester, Marquinhos put in one of the performances of the season from midfield against Manchester United at Old Trafford, as Paris Saint-Germain strode to a 2-0 victory in their ​Champions League last 16 1st leg. Another clean sheet followed in a tricky away clash against St-Etienne, with the Brazilian this time operating from his nominal centre back position. While that is where you'll likely want to put this 87 rated card in your team, his significantly amplified pace (78) and dribbling (73) may push you to bend convention. The French winger is fresh from wowing fans on this side of the channel with his performance against Liverpool at Anfield on Tuesday night in the Champions League, but this hallowed spot was earned from his two-goal showing against Augsburg in the Bundesliga. After being struck down with injury at the start of the season, Kingsley Coman is finally showing the world what he can do. With an 85 overall rating, 95 pace, 87 dribbling and 80 shooting, there's very little he can't do for your team. After a difficult start to life at ​Inter following his big money move from Roma and the comparative form of Nicolo Zaniolo, who was included in said deal, Radja Nainggolan looks finally to be settling in with the Nerazzurri. His 78th minute score sealed all three points in a tightly contested affair with Sampdoria at San Siro, and his imbued dribbling (83), shooting (81) and physicality (84) should seal a whole load more for your side. Krzysztof Piatek is the man of the hour at ​AC Milan. After joining from Genoa for €35m in Janaury as a replacement for the Chelsea-bound Gonzalo Higuain, the Polish striker has notched six goals in five games - continuing his extraordinary goalscoring record this season. And this TOTW card sufficiently reflects this purple patch of form. With elite pace and shooting (both 84) coupled tantalisingly with slick dribbling (80) and boosted physicality (82), Piatek's 82 overall card becomes one of the most complete of any of his competitors. What would this list be without this man. Mario Balotelli has been electric since joining Olympique de Marseille in January, with three goals from his four games. He continued this form with a glorious back-heel in the build up to his side's opener against SC Amiens last weekend, and a consummate finish of his own to bag the win. The card is equally special. With an 85 overall rating, you'll be sure Super Mario can recreate this and more in your side. Elsewhere, former West Ham reject Sofiane Feghouli seems to have recovered his pre-Hammers form with Galatasaray, and 87 pace and 85 dribbling on an 82 overall card is not shabby at all. Don't sleep on the 78 shooting, either.